Rapp Hydema has been supplying deck machinery to research vessels since 1977, but this global market recently became especially significant for the group. In 2002, in what would be a watershed project, Rapp Hydema was chosen to outfit the NOAA Fishery Survey Vessel (FSV) Oscar Dyson class of vessels. The first four ships in the class were being constructed at VT Halter Marine Shipyard. “That NOAA research vessel contract provided us with excellent exposure,” said Johann Sigurjonsson, President of Rapp Hydema U.S. Following the construction of the first vessel in the series, the FSV Oscar Dyson, VT Halter Marine evaluated all key suppliers for the project. 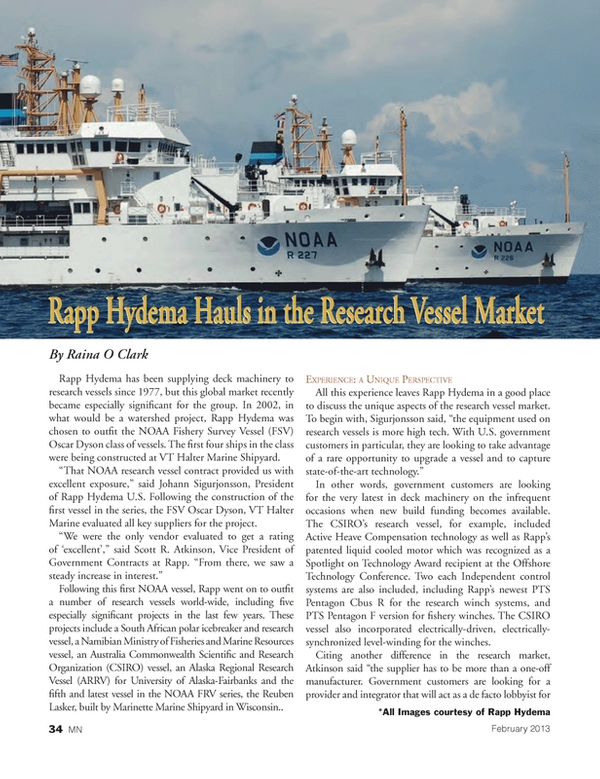 Following this first NOAA vessel, Rapp went on to outfit a number of research vessels world-wide, including five especially significant projects in the last few years. These projects include a South African polar icebreaker and research vessel, a Namibian Ministry of Fisheries and Marine Resources vessel, an Australia Commonwealth Scientific and Research Organization (CSIRO) vessel, an Alaska Regional Research Vessel (ARRV) for University of Alaska-Fairbanks and the fifth and latest vessel in the NOAA FRV series, the Reuben Lasker, built by Marinette Marine Shipyard in Wisconsin.. In other words, government customers are looking for the very latest in deck machinery on the infrequent occasions when new build funding becomes available. The CSIRO’s research vessel, for example, included Active Heave Compensation technology as well as Rapp’s patented liquid cooled motor which was recognized as a Spotlight on Technology Award recipient at the Offshore Technology Conference. Two each Independent control systems are also included, including Rapp’s newest PTS Pentagon Cbus R for the research winch systems, and PTS Pentagon F version for fishery winches. The CSIRO vessel also incorporated electrically-driven, electrically-synchronized level-winding for the winches. A Single-System Vendor (SSV) or a Scientific Handling Systems Integrator (SHSI) is an added value government customers are frequently looking for. It’s easy to find a company that manufactures a particular product, Atkinson said, but what the government customer needs is someone who can serve as a one-stop-shop, integrating products from other vendors as well. “We are responsible for the overall layout and functionality of the deck machinery package,” said Sigurjonsson. Rapp’s role as SSV with NOAA’s Fisheries Survey Vessel program helped in the company’s selection as SHSI for the Alaska Regional Research Vessel (ARRV) operated by the University of Alaska-Fairbanks. In 2010, Rapp was awarded a contract to supply the ARRV with oceanographic traction, hydrographic and CTD winches, plus two storage reels, winch control and level wind systems. Finally, a high degree of customization also distinguishes the research vessel market. Building good relationships with shipyards has also stood Rapp Hydema in good stead. In 2010, Rapp was contracted to supply an electric deck machinery package to the South African polar icebreaker and research vessel, A.S. Agulhas II, built by STX Finland Oy. The vessel 440-foot multi-purpose was delivered in April 2012 to the South African Department of Environmental Affairs. Designed primarily to carry out research operations and expeditions for the South African National Antarctic Program, it can also serve as an icebreaker and cruise ship. Rapp Hydema’s package included tandem HW-2300E CTD winches, single vertical plankton and towing winches, a general purpose towing winch, a deep sea coring winch, an undulating winch, a capstan and scientific winches. Rapp’s latest computerized winch control and monitoring system, the PTS Pentagon Cbus R, integrates all winches and provides varied automation and data-logging functions. Following this project, in late 2011 Rapp was selected to supply a deck machinery package to another new research vessel; also built by STX Finland Oy. This time, Rapp supplied a combination electric/hydraulic deck machinery package to the Mirabilis, delivered to the Namibian Ministry of Fisheries and Marine Resources. The Mirabilis supports fisheries, meteorological and water quality research, and unlike the old vessel she replaced, the Mirabilis has deep water trawling capabilities. For this project, Rapp provided hydraulically-powered trawl winches, a double net-drum for net storage, a Gilson winch, a research/sounder winch, an anchor winch with two capstans and two separate hydraulic power packs. The trawl winches are controlled by a PTS Pentagon Cbus F system enabling auto trawl functions for both bottom and midwater trawling operations. Rapp also supplied an electric CTD winch that handles up to 6,000 meters of armor-coated cable and an electric Plankton/net winch with a wire-holding capacity of 3,000 meters of EM cable. The electric winches use Rapp’s PTS Pentagon R7E control system. This year two more important research vessels featuring Rapp deck machinery packages will be delivered. NOAA’s 208-foot FSV Reuben Lasker, the fifth in the Oscar Dyson series, is now being completed at Marinette Marine Shipyard and will soon be delivered to the Southwest Fisheries Science Center in San Diego. In addition, Australia’s CSIRO research vessel, the Investigator, is scheduled for delivery in mid-2013 and represents Rapp’s largest government research contract ever. Rapp supplied 180 tons of deck machinery to this state-of-the-art vessel which will be capable of spending 300 days at sea annually and support activities across a range of disciplines in oceanographic, climate, geological, fisheries and ecosystem research. The ship will have no less than three winch rooms and work at extreme water depths which call for wire and cable-holding capacities of 6,000 to 8,800 meters. By demonstrating innovative technology and an integrated approach, Rapp Hydema is now positioned at the forefront of the deck machinery world for research vessels. Already having supplied government fleets involved in various research missions in 14 countries, and as the need for research on global climate change, ocean temperatures, fisheries and other related areas increases, Rapp Hydema is well placed to meet the coming demand.